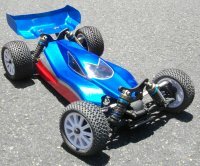 The Bugle Boy Racing body for the Yokomo B-MAX 4 III. 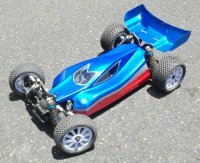 Designed to give high downforce with low drag and good options for cooling the motor and ESC. Features the classic Bugle Boy Racing teardrop shape cab, with upswept sidepods at the rear to provide extra downforce and maximum airflow to the rear wing. Also features cooling options in the form of cutouts at the front of the side pods. These have cutting lines marked, but don't look like scoops if you are not using them, and therefore they don't create any unnecessary drag like the stock shell's scoops.